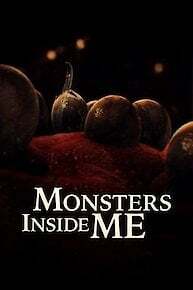 Monsters Inside Me is a documentary series that airs on Animal Planet. Monsters Inside Me shows what happens when parasites and microscopic bugs enter a human being and decide to live with the human as their host. When a parasite enters the human body it usually causes a bad infection, resulting in the infected human suffering a horrible illness that can be next to impossible to cure. There are many different types of parasites out there and each episode of Monsters Inside Me concentrates on a specific parasite and what the resulting harm was to the human being that it affected. The series shows graphic and disturbing pictures of the parasites and brings on scientists and other experts to discuss the life cycle and habitats of these gruesome creatures. The people on the show range from old to young. There are even episodes where children are shown and discussed getting sick so this television series is definitely not for the faint of heart. The show covers common parasites like the bedbug and hookworm but it also introduces the viewer to species that they may not of heard of, like the cat poop parasite or the brain eating parasite. Parasites can do frightening things to the human body and the show introduces viewers to infections that are extremely rare. The African sleeping sickness is one such infection that leads to extreme fatigue. There is also the screwworm infection which will tear a giant hole into a person's flesh. Monsters Inside Me is scientifically based and delivers a lot of new information on virtually unheard of parasites. Three unsuspecting victims see the holidays turn from a time of joy and merriment to fear and agonizing pain as they battle against mystery attackers trying to destroy them from the inside out. After a man hits his head, he's left fighting a one-on-a-million medical mystery; a boy's wounded knee becomes home to an uninvited guest; a man unwittingly feeds his own intended killer. A dangerous parasite strikes a woman down; an infant suffers a mysterious illness; a fungus brings a man to the brink of death. An infant is suddenly paralyzed; a young father grapples with a monster that threatens to blind him; a woman's excruciating pain confounds experts. A man coughs up blood; a newlywed husband is felled by a rare disease; a father struggles with abdominal pain. A teenager develops mysterious blotchy sores; an athlete is struck down by a rare disease; a woman battles strange bouts of vomiting. A toddler falls into a trance-like state; a strange condition strikes a boy; a woman's symptoms push her to madness. Doctors discover an invader in a young man's brain; a new mother is in critical condition; a young boy's illness defies antibiotics. An infant falls mysteriously ill. A biology professor becomes an unexpected host. A family man is brought to the brink. A man experiences bizarre swelling around his eye; a 12-year-old girl falls mysteriously ill; and a young woman is struck by a bizarre set of symptoms that leaves her on the verge of madness, and neither her family nor her doctors can understand why. A man falls comatose. A college student's sore throat turns deadly. A woman's unusual symptoms confound experts. A young girl is brought to the hospital with stabbing pains in her scalp; a wife and mother is struck down by a severe string of mysterious symptoms that threaten to tear her family apart; and a deadly invader turns a relaxing vacation into a nightmare. A Christmas baby is born, but doctors find her brain was infected in utero. A woman is convinced a worm is in her eye, and a man gets a nasty surprise after surgery. Three families are turned upside down by deadly monsters. A four-year-old boy is plagued by crippling pain. A college student with a small cut finds herself fighting for her life. A woman is driven to insanity by an intruder in her own body. A family's cruise ship vacation turns into a living nightmare when their two year old swallows a sinister monster. A mother of two is plagued with a mysterious infection. Deadly parasites hijack the brain of a six-year-old boy. Episode 3 - There's Something Living in My Hand! Episode 2 - I Have A What In My What? Monsters hiding where you'd least expect. A child struggling to breathe. A man with something living in the last place he'd want. A woman with weight gain that confounds experts. Who are the monsters inside them? Monsters Inside Me is currently available to watch free on Animal Planet and stream on Animal Planet. You can also stream, download, buy, rent Monsters Inside Me on demand at Amazon, Vudu, FandangoNow, Google Play, DIRECTV NOW, iTunes online.